Automate Your Deal Flow because it makes it easier for you! Jack Butala: Automate Your Deal Flow. Every Single month we give away a property for free. It’s super simple to qualify. Two simple steps. Leave us your feedback for this podcast on iTunes and number two, get the free ebook at landacademy.com, you don’t even have to read it. Thanks for listening. Jill DeWit: And sell it on the internet really fast. Jack Butala: I’m Jack Butala. Jill DeWit: I’m Jill DeWit. Jack and Jill: We are Jack and Jill and this is the Jack and Jill Show 2. Jack Butala: With over 15,000 completed transactions, we’re the experts at acquiring property. Jill DeWit: Of all kinds, not just land. Jack Butala: For half price and flipping them for way more. Jill DeWit: All right. Let’s get this show started. Jack Butala: Welcome to our show. In this episode, Jill and I talk about how to automate your deal flow. Before we get to it, let’s hear some funny/interesting stuff that happened to us. Jill? Jill DeWit: Hey. I bought some squishy wine glasses from the husband of a Family Guy writer. How weird, random is that? You know what I mean? Jack Butala: I know. I remember that. I remember you talking about that. I still haven’t seen these squishy wine glasses, though. Jill DeWit: No. They’re in LA. Jack Butala: What are they ? Jill DeWit: Imagine a stemless wine glass. We all know what that looks like. There’s glass ones out there, but they made a squishy material and it’s like it’s designed to not really fall over that. Jack Butala: Is it glass anywhere? Jack Butala: It’s good that you did that. Jill DeWit: They’re squishy and so they won’t break should you knock it over. Jill DeWit: Yeah. It shouldn’t break, anyway. It was random, weird that the guy that I bought them from his wife was one of the writers and she’s off doing something. She’s writing a screenplay or something now. Jack Butala: I’m shocked that woman is even involved in writing Family Guy because it’s crude. Jill DeWit: Right. There actually was involved, right. How worse could it have been if a woman wasn’t there? That’s what I want to know. I’m sure she was there cleaning it up a little bit. Jack Butala: Maybe that was her job, you guys are way over the line on this. Jill DeWit: Yeah. You cannot do that. Jack Butala: That’s like your job too. Jill DeWit: Could you imagine? That’s exactly my job. That is exactly why I’m here. I’m here right now to reel this whole thing back in. Because if I was not here, well silicone would’ve gone 18 different directions. Jack Butala: Yeah, it would have. Jill DeWit: Number 1 and squishy too, that would’ve been involved, so anyway. Jack Butala: We’re all really 12-years-old. Jack Butala: All of us in the world. Jill DeWit: I thought you meant you and me in our office. Anyway, I just thought that was really funny. Jack Butala: Let’s take a question posted by one of our members on successplant.com. It’s our online free community. Jack Butala: Well, I have. I have considered this. Jill DeWit: Oh, my goodness. Jack Butala: I have done it. Jack Butala: We’re actually preparing to own a title agency. Jill DeWit: That’s part of the training. Jack Butala: It’s one of the services that we will provide next year for our members, so yes. I will say this and please everyone retain this, more education is always better. Jack Butala: Even if you’re a female in the Middle East, well if you are a female in the Middle East, you know this. I implore you to spread the word. Jack Butala: More education is always better. All joking aside. You’re right, we talk about it a lot. Finding properties and solving some title issues when people have passed on or somebody is paying the tax bill and the property is in someone else’s name, that’s part of our business. The more you can learn about it, and we talk about it all the time in our group here, the better off you’re going to be. Jill DeWit: Right. I love that. You want to know a lot of these basics. There’s a lot of stuff you can Google and search as you go and learn about things as you go, but a little course like this, it’s great. My only curiosity, I didn’t look these two up that Chris put here, but I’m curious if they charge anything. Because if they do, we could do something like a cheaper, I’m sure. Jack Butala: I copied and pasted this from Success Plant and the answer … This is a question and answer from two separate people. You can’t see the way I copied and pasted it, but the answer was … Somebody answered the question. Go to learntitlesearching.com or titlesearchcourse.com. I don’t know if they’re free, but get what you can get out of it. If it’s a good idea, maybe pay for it. We’re going to provide all that stuff. We just haven’t. It’s on the list. Jill DeWit: Yeah. We kind of do. Jill DeWit: We do our own research. Jack Butala: Yeah. Why not just make it official? That’s what I’m saying and we’re doing it. Jack Butala: In the meantime, do not sit around and wait for us to do these things. Do your deals. Jack Butala: Make some money. Jack Butala: If you have a question or you want to be on the show, reach out to either one of us at successplant.com. Today’s topic, excuse me, automate your deal flow. What the heck? How do you automate your deal flows? This topic came up because one of members and quite frankly my little sister was in town and she’s in incredibly successful real estate in northern Michigan. We were talking about automating all the stuff we do, and so through a series of questions, I learned what she does that’s imperative to her success. Super long story short, about 90% of what she does is just back office silly stuff. 10% of it is what makes her successful, which is talking to the customer, basically earning their trust and doing the real estate, maximizing price for them, just getting a deal done. That’s benefiting her customer. Representing them well. If you can automate all the back office stuff and the things that are not … We are incredibly successful for exactly two reasons. Number one, I know who to send mailers out to. I know who to send offers to. I’m good at that. Jill is incredibly good at talking to people when they’re interested in selling their property or talking to them when they’re interested in buying it. She doesn’t do it that much any longer, but she’s also good at managing the people who do it. She knows what it takes. Those are the things that we’re good at. Some people are incredibly good at it doing deeds or doing title searches or whatever. With the non-imperative stuff that makes you successful, you want to automate that. This is my opinion. We also have a member who automates 100% of it. He never talks to them at all. I don’t think that’s a good idea, but it works for this guy and he’s super successful and he talks about it a lot. He’s on the internet all over the place. Jill DeWit: I think that it’s just sending out more offers then, too, is the problem with that. Just upping your numbers because you got to get a certain response back of people that want to sell their property. There’s some people that … We have them. They may be elderly, they don’t even understand answering machines or voice mail. They’re not comfortable with that, so they won’t do it. You just got to up your numbers to get the same response of stuff to buy. It’s not crazy. Jack Butala: I see a lot of people beating themselves up at failing at a small part of something. I am not a good paper pusher, but I don’t sit around and beat myself up. I find somebody else to do it. I find it cheap and I solve the problem and I concentrate on the stuff that I’m really good at. I think a lot of people they love real estate, they get into it, and they find out they don’t like every single [element 00:07:59] of it. They say I want to move on to something else. Jill DeWit: Yeah. This isn’t for me. Jack Butala: Right. That’s not the case. Jill DeWit: Yeah. It’s really not true. Jack Butala: Really, it’s just two or three tiny little parts of it that aren’t for you. Jill DeWit: I want to learn. Yeah. Like we talk about, you want to learn all the little moving parts and know them, and then figure out what you are best at, like you’re saying Jack, and just focus on that. Jill DeWit: You’re right. Don’t beat yourself up over those things. That was interesting. Good point. Jack Butala: You are not alone in your squishy silicone ambition. I got a good laugh out of that from you. Jill DeWit: Yes. It’s good. Jack Butala: Was that over the line? Jill DeWit: No. It’s good. Jill DeWit: No. That’s really, really good. No, it’s funny that you brought up the whole you think there was a girl, I didn’t know there was a girl involved in that. Jack Butala: I don’t even think women watch that show. Jill DeWit: Not unless … No, unless we have to. Jack Butala: I know when it’s on, you leave the room. Jill DeWit: Yeah. I’m like yeah, see you. I’m out of here. Jack Butala: I don’t sit around and watch it by myself. We have a 13-year-old son and that’s maybe the funniest thing I ever seen. Jill DeWit: [Is that true 00:09:18]? 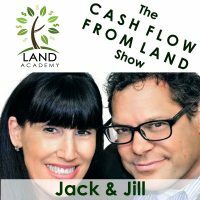 Jack and Jill: We are Jack and Jill and this was the Cash Flow from Land Show. Jack Butala: We are the experts at acquiring property. Jack Butala: For half price, just so we can flip it for way more. Jill DeWit: And really fast. Thanks for listening. Jack and Jill: Let’s go buy some property. Jack Butala: If you want to get involved or you need for information about our profitable [nichy 00:09:44] real estate operation, call 480-467-0359. You just might get Jill at the other end of the line. Jill DeWit: Landacademy.com, you are not alone in your real estate ambition.